Forays of a Finance Foodie: Svelte Snacks: Healthy Treats Under 250 Calories! Since I’m slightly lactose intolerant (like most Asians), its soy milk to the rescue for my calcium needs on my brittle Asian bones! Earth Balance is the only refrigerated soymilk product that is both organic and non-GMO project verified, so drinking this product is not only good for me but good for the environment as well. I love Roba Dolce’s Lemon sorbetto, as it tastes like a less artificial version of Lemon Ice from my childhood days at Six Flags. But in all “honest(ea)”, I only drink kombucha because aids in digestion and supports a healthy G.I. tract (the slightly medicinal flavor of kombucha is not something I run over obstacles for). However, Honest Tea’s organic and Fair Trade Certified kombucha is enhanced with a touch of cane sugar and flavoring to make this beverage more drinkable than its competitors. Ok so this isn’t super nutritious, but a girl has gotta indulge once in a while right? (Plus that’s why I take my multivitamins :). These bite-sized treats are just the right size to grab and go for a quick pick-me-up. 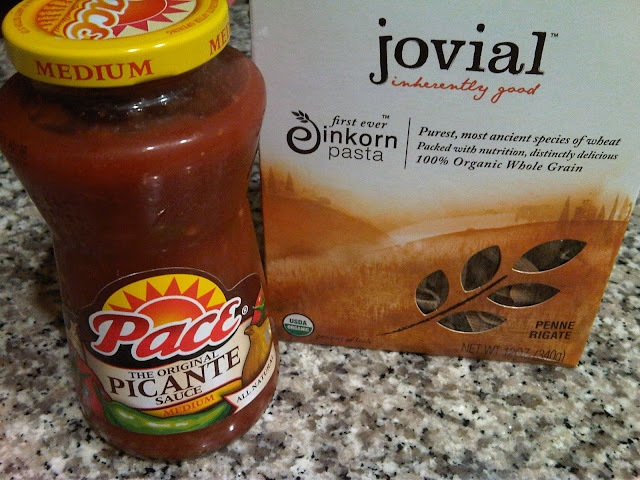 I love picante sauce on everything – including pasta (weird combo, but it works)! I especially love Jovial’s Einkorn pasta because this PASTA IS INHEIRENTLY FLAVORFUL ON ITS OWN (sorry Barilla – but you cannot compete against this wonder pasta)! Einkorn pasta is also higher in fiber and protein than other whole wheat pastas, and has a higher concentration of important vitamins and minerals (i.e. 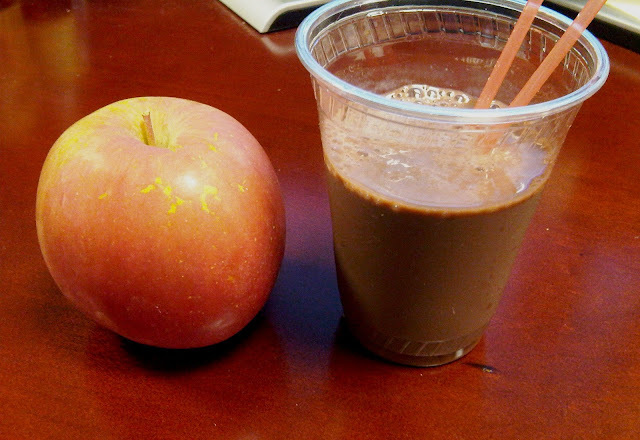 thiamin, phosphorus and magnesium). And those are all good stuff my body and mind can use! Imported from Italy, this line of no sugar added jams are bursting with fruit in every bite (literally – as over 2 kg of fruit is used in each jar). 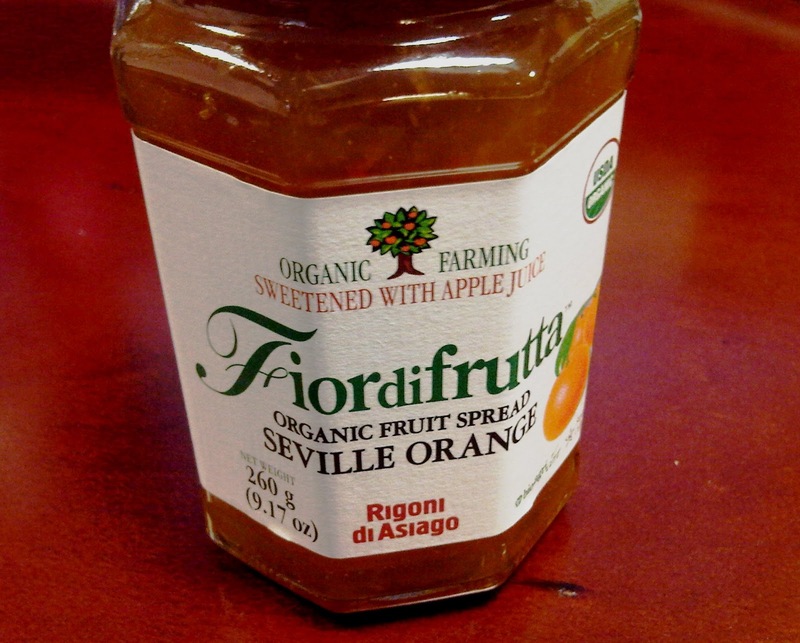 These jams are so fierce – it would be an atrocity to my tastebuds and body if I went back Smuckers after having these organic fruit filled babies! Simple, healthy, and satisfying (SHS)! I’ll follow up this post next week with more SHS snack options (that is, if I manage to stick to my no coffee plan). So until then – happy and healthy snacking! "My grandma deserves a sweet treat! She's been a bit depressed lately & I think this would cheer her up a bit." Pillsbury wants one of my lucky readers to indulge moderately while snacking by sending them a "Sweet Moments" prize pack. The prize pack includes 2 VIP coupons for Sweet Moments Brownies and a Sweet Moments t-shirt, magnet and very pretty necklace. Contest ends October 25, 2010 at 5pm EST. Winners will be chosen via random integer generator on random.org announced on the financefoodie.com site shortly afterwards that night! Pillsbury provided me with the Sweet Moments brownies to review and the products for the giveaway through MyBlogSpark. My best friend deserves a sweet moment. She was ill last week but still managed to find time to listen to a problem I had. Just knowing she was there for me really helped me out. My hubby and I need to share a sweet moment together. He works twelve hours on night shift and sleeps during the day. So not much kid free time. I think my daughters deserve a sweet moment. They work hard in school every day. My husband deserves a Sweet Moment because he never complains and does without so that the rest of us can have what we want. My grandma deserves a sweet treat! She's been a bit depressed lately & I think this would cheer her up a bit. My fiance is very deserving of a "sweet moment". He's been working a minimum of 60 hours a week for the past month. My grandma deserves sweet moments because of all the hard work she does. My Mom deserves a sweet moment and I would love to give this to her:) Please enter me. Thanks! My friend, Jill, deserves a sweet moment as she is recovering from surgery. My best friend LeAnn deserves a sweet moment. She organized our Bunco group and we had our first Bunco Night recently and it was a lot of fun! My son deserves a sweet moment as he is going through a hard time at school with being bullied. He works really hard and is a good kid. I Follow Finance Foodie on Twitter. My boyfriend deserves a sweet moment because he works so much. But since he doesn't like sweets much, I'll have it for him! I'm a mom of 3, homeschooling one of them, college student, volunteer, and a military wife so I hope it isn't too darned self-centered to say I am the one in this house who deserves a sweet moment! With 3 kids and very little "me time" I need it! My Brother, who recently found a job after seeking one for eight months! My husband deserves a sweet treat for always taking care of me! Thanks! My guy definitely deserves a sweet moment because he works super hard. Actually, I could use a moment, or two or three! With three boys I'm constantly on the go. My Grandma deserves a sweet moment. She just turned 90 a few months ago and she is maybe more energetic then I am..Maybe it's the chocolate she loves. My mom deserves a sweet moments because she is always trying to make others happy and never takes time for herself. My mother needs a sweet moment. I could use a sweet moment--because I have been job hunting and it is not going well, me self esteem is shot--I could use something yummy to lift my spirits. My mom deserves a sweet moment. My mom and dad-My dad still goes to work every day, he's 84 and does construction and my mom is 83 and battling cancer. Yeah they could use a sweet moment! My very hard-working husband - we've been married 33 years - deserves a Sweet Moment. my husband deserves a sweet moment, he has really been having a rough go of it lately. I do! I have been doing some heavy Fall cleaning! My boyfriend deserves a sweet moment after I spent our entire week-long vacation sick in the hotel room with the flu. Not very romantic but he was so supportive. I am going to say me,have way to much on my plate and could use a moment! My aunt deserves a sweet moment because she's currently going through a rough patch. My husband does because he's been so helpful during my pregnany. My mother deserves a sweet moment. I do! I've been job hunting for a couple years without success. I could use a pick-me-up! i follow Finance Foodie on twitter - js22222222 . My daughter deserves a sweet moment because she has been sick lately. My mom deserves a sweet moment, she works so hard! I do! Need a sweet treat once in a while! My hubby. He is the best and puts up with me and never gets mad at me. Pretty amazing! Follow Finance Foodie on Twitter-dresdenrain. No one deserves a sweet moment like my Mom who is the most loving person I know. I REALLY REALLY DESERVE A SWEET MOMENT.